Arm In Arm is a place where our community comes together to make sure we all have the most basic needs of food and shelter and, as possible, the livelihood to maintain them. We believe that it takes our whole community to ensure that everyone thrives. And we believe that when everyone is thriving, we all benefit. Neighbors partner with us to shop for healthy food for their families … work out a plan to keep a roof overhead … and sharpen their skills for a changing job market. And neighbors—from just up the street, throughout the area, and beyond—partner with us to devote time and talent to volunteer service; provide financial, philanthropic, and in-kind support; give faithfully with their congregations; collaborate in local agencies; and run grassroots initiatives like food drives and personal care kit drives. Because truly, we are better together. For nearly four decades Mercer County families have turned to Arm In Arm for essential resources like food and financial support. Formerly known as The Crisis Ministry, we were founded in 1980 by leaders of Nassau Presbyterian Church and Trinity Church in Princeton to help community members who were struggling financially. Today twenty staff members and hundreds of volunteers welcome more than 4,000 families to our food pantries, work with 600 at-risk families to prevent or end homelessness, and offer on-the-job training and job search mentoring. 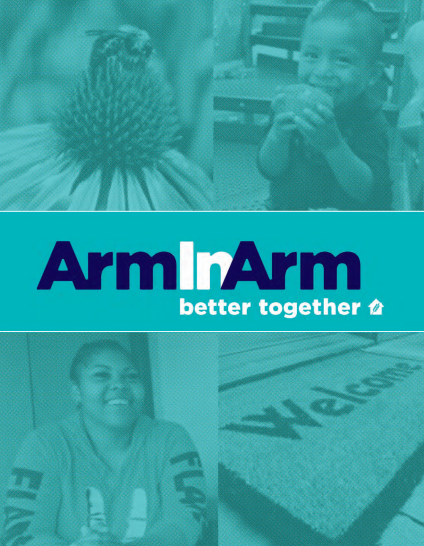 In 2016, we changed our name to Arm In Arm to reflect the positive partnership we have with our community and the collaborative spirit we have in supporting our neighbors in need. Arm In Arm is a non-profit, 501(c)3 charitable organization, and does not endorse a specific political or religious viewpoint.